I posted this photo on Instagram yesterday and I thought it would be a good idea to answer some questions about using my coloring book. - Right now I’m into markers. I got some Prismacolor Double-Ended Art Markers for my birthday and I’m really hooked. One end has a flexible brush tip which is wonderful to give strokes a more organic look. The other side is a fine tip which is great for more detailed work. 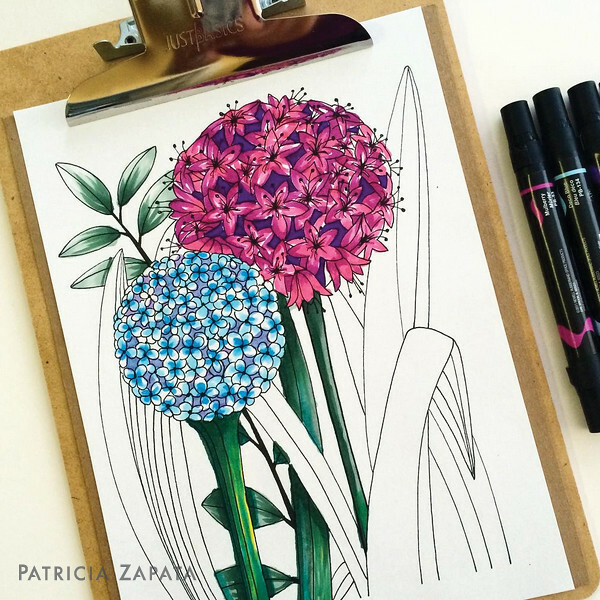 - I’ve always been partial to Prismacolor colored pencils. Thery're just the best. - Pastel pencils - My dad had a set when I was little and I was so careful with them. I just thought they’d crumble under the pressure I used back then. I've loved them ever since then because the blending options and soft look is just beautiful. I want to give them a try again with these coloring pages. - Good old regular lead pencils. Sometimes I keep a drawing in black and white and just add some shading. That’s a lot of fun too and less decision making. The coloring book has illustrations on only the right hand side of each spread - so the backs of all the drawings are blank. This makes it safe to use markers. Just remember to place an extra sheet of paper behind the page your working on so that the ink doesn’t bleed onto the next image. I move my paper around a lot when I’m coloring or drawing. Sometimes I want a stroke to be just so and the angle of the page is just wrong if I keep it straight in front of me. That's why I like single sheets. My coloring book pages aren’t perforated (it would’ve made the book much more expensive!) but you can cut them out with a few simple steps. 1. Place a letter-sized sheet of chip board or cardboard (a cut out of a cereal box would be perfect) behind the illustration you’d like to cut out. 2. Place a ruler at the point where you’d like to make the cut. 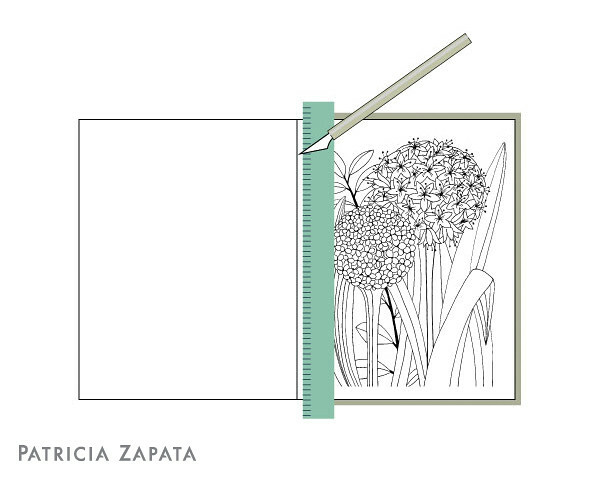 Make sure the ruler is covering the image to protect it (in case your blade goes in the wrong direction!). 3. Make sure the cardboard is pushed in as close to the spine as you can get it and under the area you’re going to cut. 4. Hold the ruler steady and cut. Done! As you can see in the photo I also used the cardboard to protect my clipboard from the ink bleeding through the page. I hope these easy tips help you out. If you have any other questions feel free to ask below. Thanks again to all of you that believe in my work and have been ordering my coloring book. It’s been an exciting week! If you don’t have a copy of Flower Nook: A Coloring Book just yet you can order one on Amazon. If you do - thank you! - if you have a few minutes I’d appreciate you leaving a review on the. I’d love to see what you think!